This section explains the four types of early retirement benefits—and the rules that apply to each. If you qualify for PEER or the Rule of 84 or have recent coverage, your benefit is higher. You must be retired from employment to receive early retirement benefits. 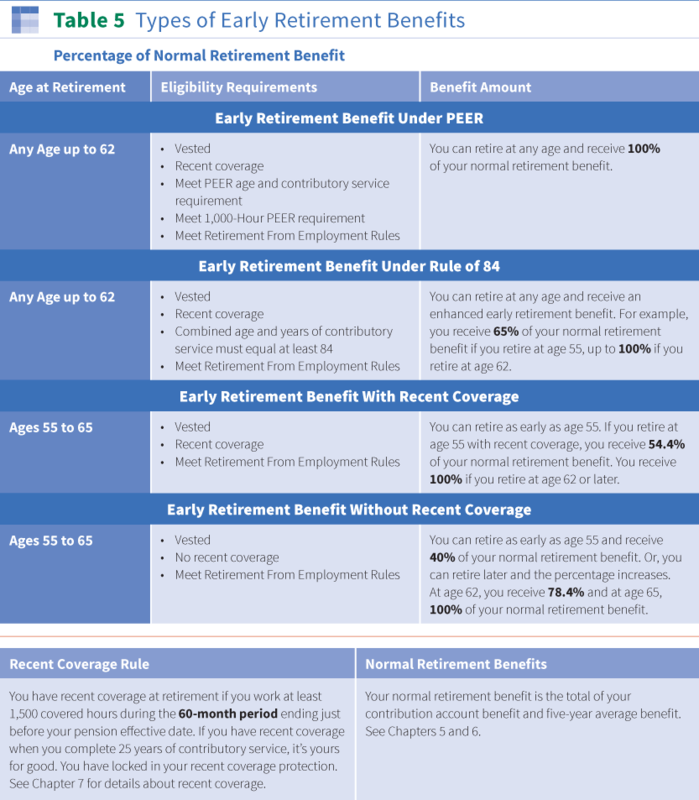 Early retirement benefits under a PEER program. Early retirement benefits under the Rule of 84. Early retirement benefits with recent coverage. Early retirement benefits without recent coverage. The eligibility requirements for the four types of benefits are similar in many ways. But the date you choose as your pension effective date and your monthly benefit amount may vary depending on which early retirement benefit you receive. Since most of these early retirement benefits are only available to participants with recent coverage at retirement, see the Recent Coverage section for more information. In general, you have recent coverage at retirement if you work at least 1,500 covered hours during the 60-month period ending just before your pension effective date. If you have recent coverage when you complete 25 years of contributory service, it is yours for good. You have locked in your recent coverage protection. Click here to view a summary of these four types of early retirement benefits available to vested participants. It briefly describes the eligibility requirements, earliest retirement date and benefit amount for each type. Before you can begin receiving early retirement benefits you must be considered retired from employment. Click here for information about the retirement from employment rules. If you fail to meet these rules, your retirement benefit is canceled. You must pay back all benefit payments you received and you need to reapply for retirement when you meet all retirement eligibility rules. Once you retire from employment before age 65, you forfeit or lose your right to receive your retirement benefit payment for any calendar month when you work in suspendible employment and the hours you work equal or exceed the applicable hours limit. These rules only apply up to age 65. The Working After You Retire section explains these rules in more detail and how your reemployment after retirement can affect your eligibility to receive your retirement benefits. It’s important that you contact your Administrative Office if you have any questions regarding working after retirement. No matter which type of early retirement benefit you receive, the amount is always based on your normal retirement benefit. Your contribution account benefit for covered employment in 1987 and later (see Contribution Account Benefit). Your early retirement benefit is calculated by multiplying your normal retirement benefit by your early retirement factor. 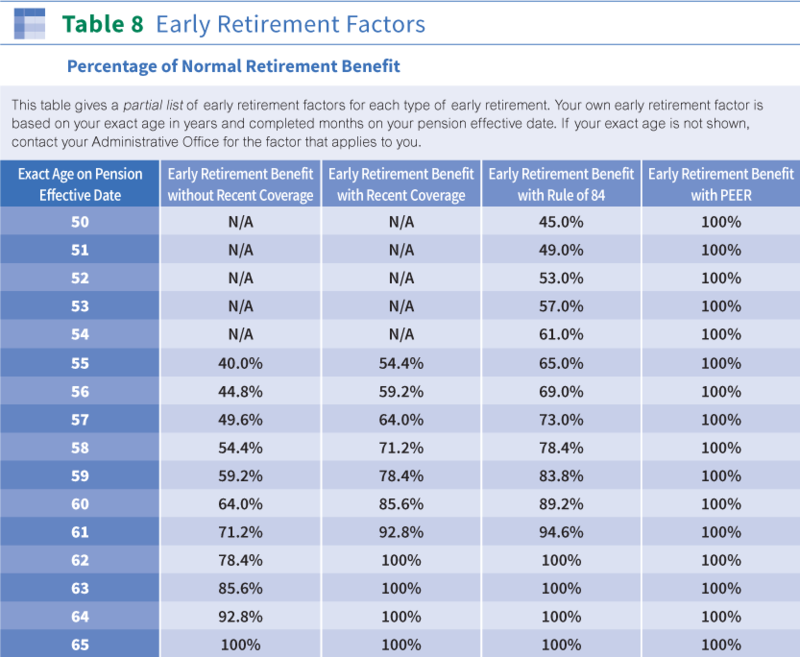 Click here for Table 8 which shows a partial list of early retirement factors for each type of early retirement benefit. The factor is based on your exact age on your pension effective date and the type of early retirement benefit you are eligible to receive. 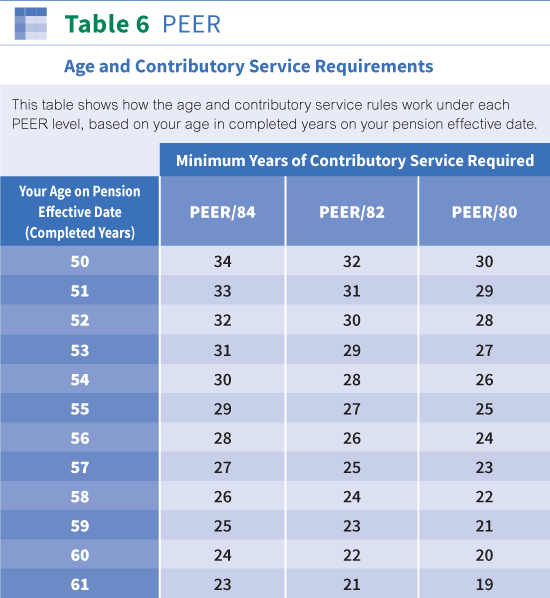 As Table 8 shows, the PEER programs let you retire early with unreduced benefits at any age after you are eligible. If you have recent coverage, you can retire early with unreduced benefits at age 62 or later. All four types of early retirement benefits are explained below. Each PEER level has its own age and contributory service requirements for early retirement. You can retire with unreduced benefits when your combined age plus years of contributory service add up to 84 or more. Example: If you are age 52 at retirement and have 32 years of contributory service, you meet the age and contributory service requirement for PEER/84. You can retire with unreduced benefits when your combined age plus years of contributory service add up to 82 or more. Example: If you are age 52 at retirement and have 30 years of contributory service, you meet the age and contributory service requirement for PEER/82. You can retire with unreduced benefits when your combined age plus years of contributory service add up to 80 or more. Example: If you are age 52 at retirement and have 28 years of contributory service, you meet the age and contributory service requirement for PEER/80. The Program for Enhanced Early Retirement (PEER) allows long-service participants to retire before age 62 with benefits that are not reduced for early retirement. There are three PEER levels (PEER/84, PEER/82 and PEER/80), each with its own age and contributory service requirements (explained above). To participate in one of these levels, your covered unit must negotiate a supplemental PEER contribution paid by your covered employer in addition to the basic contribution rate. Just because you may work under a PEER agreement now or later does not mean you qualify for enhanced early retirement benefits. Your employer and your local union must agree in writing to participate in the same PEER level for all employees covered by the pension agreement. The Board of Trustees must accept this election to participate in PEER. Your employer must agree to make supplemental PEER contributions to the Plan for your work (and the work of all other employees covered by the pension agreement). You can find out whether you are working under a PEER pension agreement (and, if so, at which PEER level) by contacting your Administrative Office. Supplemental PEER Contributions. To participate in one of the three PEER levels (PEER/84, PEER/82 or PEER/80), your covered unit must negotiate a supplemental PEER contribution paid by your employer in addition to the basic contribution rate. Supplemental PEER contributions are not used to calculate Plan benefits. They help pay for enhanced early retirement benefits through PEER. Year of Contributory Service. You earn one year of contributory service for each calendar year in which you complete at least 500 covered hours. You can only earn one year of contributory service for each calendar year. Past employment and hours of service that are not covered hours do not count toward your years of contributory service. For example, hours of disability absence do not count as covered hours. 1,000-Hour Requirement. There are two ways you can meet the 1,000-hour requirement. Any covered hours you complete under a PEER pension agreement that are not within the applicable 24-month period do not count toward meeting the 1,000-hour requirement. You meet the 1,000-hour requirement for PEER/84 if you work at least 1,000 PEER/84 hours under a PEER pension agreement in the 24-month period ending just before your pension effective date. PEER/84 hours are covered hours for which your employer is required to make supplemental PEER contributions at the PEER/84 rate. You meet the 1,000-hour requirement for PEER/82 if you work at least 1,000 PEER/82 hours under a PEER pension agreement in the 24-month period ending just before your pension effective date. PEER/82 hours are covered hours for which your employer is required to make supplemental PEER contributions at the PEER/82 rate. You meet the 1,000-hour requirement for PEER/80 if you work at least 1,000 PEER/80 hours under a PEER pension agreement in the 24-month period ending just before your pension effective date. PEER/80 hours are covered hours for which your employer is required to make supplemental PEER contributions at the PEER/80 rate. Click here for an example of how to qualify for PEER/80. Covered hours that you work on or after your pension effective date do not count toward the 1,000-hour requirement. A special rule applies if your bargaining unit negotiates into a higher PEER level. If you have less than 25 years of contributory service, you only meet the 1,000-hour requirement for that higher level when you earn at least 1,000 PEER hours at the higher PEER level in the 24-month period just before your pension effective date. Once you have 25 years of contributory service, you meet the 1,000 hour requirement for the higher PEER level by having 1,000 PEER hours at the higher PEER level in any 24-month period ending after your 25th year of contributory service. Your early retirement benefit under PEER is equal to 100% of your normal retirement benefit no matter what age you decide to retire. This amount assumes that you choose the life only pension. If you choose a form of payment other than the life only pension, your benefit amount is different. Click here for information about payment options. Click here for an example that shows a sample calculation of an early retirement benefit with PEER. Even if you are covered under a PEER pension agreement and meet all PEER requirements, it is possible to lose your PEER eligibility. If too much time goes by between the last day you work under a PEER pension agreement and your pension effective date, you may not qualify for early retirement benefits under PEER (unless you have already locked in your PEER coverage at an earlier date). See PEER Lock-In Protection below. Before you decide to retire, make sure you have the required 1,000 covered hours under your PEER pension agreement during the 24-month period ending just before your desired pension effective date (unless you have already locked in your PEER coverage at an earlier date). You can find out if you meet this and the other PEER requirements by contacting your Administrative Office. Your Plan includes a lock-in feature that helps you protect your eligibility under the Program for Enhanced Early Retirement (PEER). With this feature, you can lock in your PEER coverage once you have 25 or more years of contributory service. If you complete 25 years of contributory service, you can lock in your PEER coverage by working at least 1,000 covered hours under your PEER pension agreement during any 24-month period that ends on or after your 25th year of contributory service. This lock-in protection means that even if your covered employment stops for any reason, you can take PEER retirement once you have the required PEER points to retire under your PEER level. 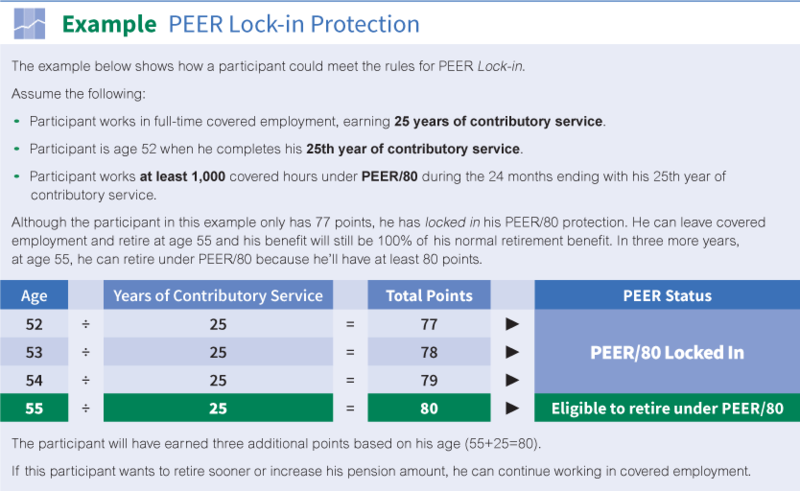 Click here for an example that shows how PEER lock-in protection helps a participant who leaves covered employment with 25 years of contributory service but before becoming PEER eligible. You can choose to have your early retirement benefit under PEER start on the first of any month after you meet all the PEER requirements. Keep in mind that under PEER you must meet the 1,000-hour requirement in the 24 months ending just before your pension effective date (unless you have already locked in your PEER coverage at an earlier date). You must apply for benefits with your Administrative Office. Click here for information on how to apply for benefits and choose your pension effective date. 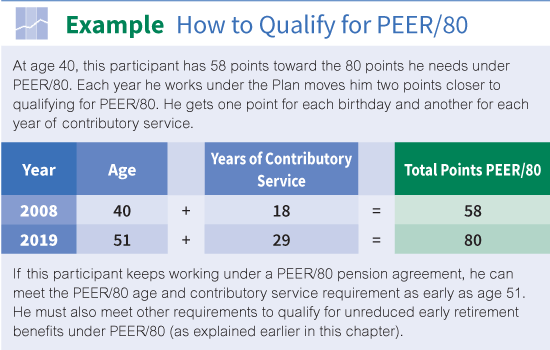 The Rule of 84 allows long-service participants who do not qualify for a PEER program to retire at any age (even before age 55). Unlike PEER, early retirement benefits under the Rule of 84 are reduced but are still higher than under the other types of early retirement benefits payable at the same age. 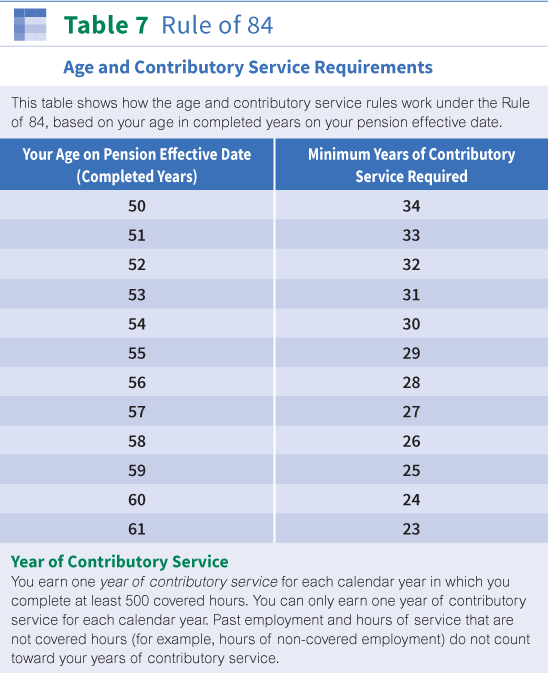 Meet the age and contributory service requirement for the Rule of 84. Click here to see how the age and contributory service rules work under the Rule of 84, based on your age in completed years on your pension effective date. Your early retirement benefit under the Rule of 84 is calculated by multiplying your normal retirement benefit by your early retirement factor. Click here to see a partial list of early retirement factors. Your own early retirement factor is based on your exact age (in completed years and months) on your pension effective date. This amount assumes that you choose the life only pension. If you choose a form of payment other than the life only pension, your benefit amount is different. Click here for information about benefit payment options. Click here for a sample calculation of an early retirement benefit under the Rule of 84. You must apply for benefits with your Administrative Office. Click here for information on how to apply for benefits and how to choose your pension effective date. If you are vested and have recent coverage at retirement, you can retire as early as age 62 with a benefit that is not reduced for early retirement. If you are not yet age 62, you can retire as early as age 55, but your benefit is reduced for early retirement. Your benefit may still be higher than if you do not have recent coverage at retirement. Be at least age 55. Your early retirement benefit with recent coverage is calculated by multiplying your normal retirement benefit by your early retirement factor. Click here to see a partial list of early retirement factors with recent coverage. Your own early retirement factor is based on your exact age (in completed years and months) on your pension effective date. This amount assumes that you choose a life only pension. If you choose a form of payment other than the life only pension, your benefit amount is different. Click here for information about benefit payment options. Click here for an example that shows a sample calculation of an early retirement benefit with recent coverage. You can choose to have your early retirement benefit start on the first of any month after you first become eligible for early retirement (usually age 55). Even if you do not have recent coverage at retirement, you can retire before age 65 and as early as age 55 as long as you are vested. Your benefits are reduced for early retirement. The reduction is greater than if you have recent coverage. To qualify for early retirement without recent coverage, you must be a vested participant between the ages of 55 and 65. Your early retirement benefit without recent coverage is calculated by multiplying your normal retirement benefit by your early retirement factor. Click here to see a partial list of early retirement factors without recent coverage. Your own early retirement factor is based on your exact age (in completed years and months) on your pension effective date. Click here for an example that shows a sample calculation of an early retirement benefit without recent coverage. Contact your Administrative Office whenever you have questions about your eligibility for PEER or other Plan benefits. Before you change jobs or stop covered employment, find out how your benefits may be affected. Click here for questions and answers about Early Retirement.